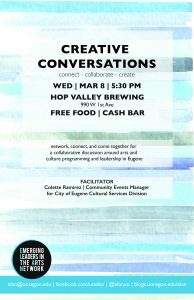 This interactive and engaging event will bring together individuals and groups who are working to cultivate arts and culture programs, events, and collaborations in Eugene. 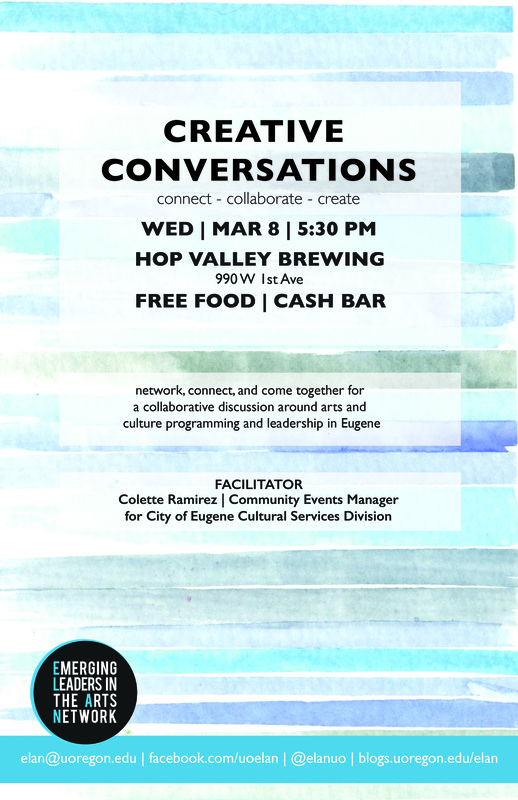 Facilitated by Colette Ramirez, Community Events Manager for City of Eugene Cultural Services Division, Creative Conversations will engage participants in a series of rotating, roundtable discussions about challenges and opportunities that individuals and organizations are facing to cultivate arts and creative projects at the UO, Eugene and beyond. challenges you might be facing, and what you’re all about! Problem solve, workshop strategies, and connect with others who are working to encourage innovative, relevant arts and culture programming and participation at the UO and in the community!